The static qtHandler() function installs a message handler using qInstallMessageHandler() and creates a QErrorMessage that displays qDebug(), qWarning() and qFatal() messages. This is most useful in environments where no console is available to display warnings and error messages. Shows the given message, message, and returns immediately. 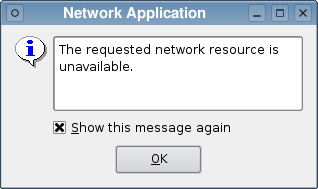 If the user has requested for the message not to be shown again, this function does nothing. Normally, the message is displayed immediately. However, if there are pending messages, it will be queued to be displayed later. Shows the given message, message, and returns immediately. If the user has requested for messages of type, type, not to be shown again, this function does nothing.